The SweetWater Music Festival promised a special celebration to mark its 15th year and it didn’t disappoint those who attended the many concerts and events over three days from September 21 to 23. Along with two sold out concerts and higher audiences for all other concert and events, there was clearly a special feeling this year as the Festival marked a legacy of world-class performers over the years and offered audiences numerous new musical memories. Board Chair Colleen Purdon adds many people have told her how much they loved this year’s Festival. ”Sweetwater’s 15th birthday was such an amazing success! There has been so much positive feedback from both first time and long time audience members. Just today a festival goer emailed to say ‘It was inspiring from start to finish…. The variety of the programs, events and venues was brilliant. The aim of providing the opportunity to hear first class musical events has been reached and the community is enriched in many ways.’"
The Festival’s sold out Opening Night Gala at the Historic Leith Church was as always an intimate and rousing evening of amazing music featuring soprano Suzie LeBlanc, harpsichordist Jason J. Moy, flutist Matthias Maute, and Fewer. He noted how the Festival started with one afternoon concert in that venue and how many in attendance were at that concert. Along with the music, SweetWater presented Meaford Mayor Barb Clumpus with a special recognition of the municipality’s legacy of support over 15 years. Saturday morning began early for SweetWater with a full slate of free, interactive music events again at the Harmony Centre. The Mozart for Munchkins event had its largest turnout ever as kids and grown ups came out for a fun time during the Musical Petting Zoo and enjoyed, a high energy concert with Kati Gleiser. Many then had a chance to see instruments up close during the Luthier Exhibit. This year was the largest display ever with seven Ontario string instrument makers on hand. The Classical Jam, the community playalong led by Fewer, also had its best attendance as local and SweetWater musicians performed one of Mozart’s most famous works, Eine kleine Nachtmuskik. Over 100 people also enjoyed the Luthier Performance featuring Quatuor Despax and Denise Djokic performing Schubert’s C Major Cello Quintet. SweetWater 2018 had the most concerts ever with six over three days. The Saturday Matinee returned with Brave New World II featuring Aiyun Huang and Denise Djokic performing contemporary works. The audience was spellbound by all three works particularly Huang’s percussion performance of Nicole Lizee’s Hitchcock Etudes, combining music and clips from Hitchcock films. SweetWater once again had a two-concert Saturday night. It began with Wait…What? at the Roxy. Mark Fewer surprised everyone with a special trumpet fanfare by composer Paul Suchan he commissioned for SweetWater’s anniversary performed by Dean McNeil, Guy Few, and Kaelin Murphy. The concert offered up some classics by Bach and Biber but also newer works by Canadians Rob Carli (who was in attendance) and Allan Gilliland. Fewer also put together a special string ensemble, SweetWater Strings, featuring the Festival’s string players. The audience moved just down the street for the sold out After Hours Again Late Night Jazz concert at Heartwood Hall. Nine SweetWater headliners were featured including Dean McNeill, Joe Phillips, James Campbell, and guitarist Graham Campbell. Young rising stars Quatuor Despax and Kaelin Murphy also performed classic jazz and some fun, Brazilian jazz in the second half. It was the perfect way to end an amazing day of music. Sunday’s matinee finale, Out With a Bang, once again was a piano lovers dream concert with pianists Kati Gleiser and Alexander Tselyakov. The final work performed at SweetWater 2018 and a first for the Festival, Brahm’s Piano Quartet in G Minor, Opus 25. In a touching moment, Fewer dedicated the performance of this work in memory of pianist Peter Longworth, a dear friend who passed away in June and was a fixture at early Festivals. 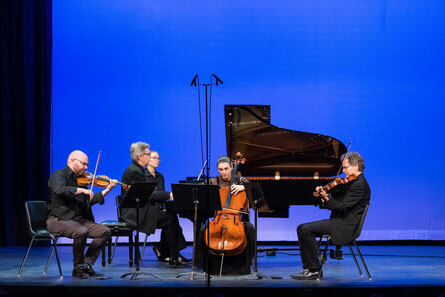 Performed by Tselyakov, Fewer, Djokic, and SweetWater vet Douglas McNabney, the audience gave them an extended standing ovation following the performance that concluded SweetWater 2018. Board Chair Colleen Purdon announced just prior to the start of the Sunday Matinee Finale that SweetWater will establishing an endowment fund to honour the legacy of Mark Fewer, who will be overseeing his final Festival in 2019. The fund will support the artistic director and musicians performing at the Festival. Further details will be released in 2019. SweetWater 2018 also marked the highest number of school outreach visits by SweetWater performers ever – three. Trumpeter Dean McNeill performed and spoke to students at Notre Dame in Owen Sound while Joe Phillips took his bass to the Georgian Bay Community School in Meaford. For the first time, SweetWater offered a school visit in French. Quatuor Despax was warmly-received by students and staff at St. Dominique Savio in Owen Sound. In total, over 120 students benefited from these visits. A special thanks to all the other sponsors, donors and volunteers for making the Festival possible. The 16th Festival will take place September 20 to 22, 2019. Watch for details about performers and more in early 2019.